They pair with an app to give you exclusive content from your favorite team. When the National Basketball Association's 2017-2018 season tips off on October 17th, it will mark the beginning of a new era for the league. For the first time in more than a decade, all 30 teams are going to wear Nike uniforms on the court. The company is replacing Adidas as the NBA's main apparel sponsor, after its sportswear rival decided not to renew a deal that had been in place since 2006. Now, as part of Nike's plan to create novel experiences for fans through this partnership, it is launching jerseys from every NBA squad with a technology called "NikeConnect." 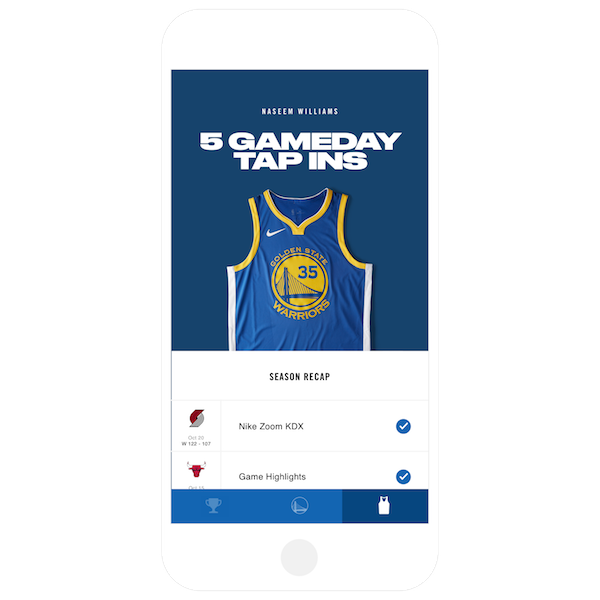 The jerseys feature authentication tags powered by Near-Field Communication (NFC), which can be paired to an iOS or Android device via a companion NikeConnect app. People who buy these will get access to exclusive content from their favorite team and players, including personalized videos, pictures, GIFs, tickets and game highlights directly from the NBA. Not surprisingly, Nike is also using the tech as an opportunity to sell you stuff, so you'll have the chance to buy limited-edition products, such as sneakers and other gear that's suggested based on whose Connect jersey you're rocking. Based on our NikeConnect demo, everything works seamlessly and with little effort. 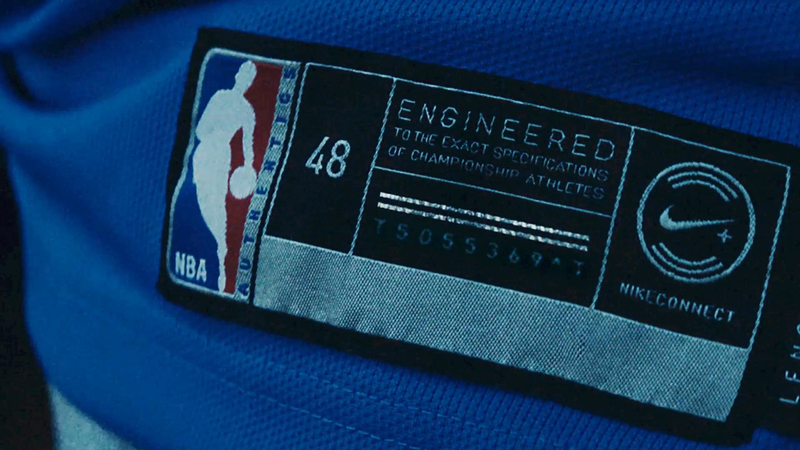 To connect your jersey to your phone or tablet, all you have to do is fire up the NikeConnect app, wait for a "Ready to Scan" prompt, tap your device on the NFC hangtag and, voila, you're good to go. After that, you'll be greeted by a video message from a player on the team whose jersey you bought. Right now, because the season hasn't started, certain content is from last year. But Nike says that as soon as the new campaign begins, you'll see game highlights, GIFs and new products pop-up. In addition to those offerings, Nike's teaming up with Spotify to serve you playlists curated by NBA athletes. And there's also a 2K18 tie-in, which will give you "boosts" to use in the video game. Again, all of the content you'll see in the app is based on whichever NBA Connected jersey you have. Say yours is from the Warriors' Kevin Durant -- then you should expect your app's feed to be filled with stuff related to him. That includes being able to buy limited-edition versions of his signature shoe, which will give you an advantage over shoppers who don't have a jersey. Nike says the key with Connect was to not sell the jerseys at a premium, or at least not for more than NBA jerseys tend to cost. They're priced between $110 and $200, with the most expensive being the "Authentic" models, which are made from the same materials as the ones NBA players wear. You'll notice subtle design cues throughout the jerseys, such as a golden tag that pays homage to the number of championships your team has won. The stitched Swoosh logo on the front is also notable, particularly because the league didn't let Adidas display its own in years past. Beyond its current app functionality, which may be a bit gimmicky, there's plenty of potential for Nike to use Connect in more ways. What if the company adopted the technology to fight counterfeits? Something like what's being done in football, where NFC tags are being used to help teams keep track of memorabilia. When asked that question, a spokesperson said the company's certainly looking into all options available, though nothing is officially in the works at the moment. Nike's focused on making Connect work with the NBA at the moment, but it's only a matter of time before it brings its jersey tech to other sports. The company already has a deal with the National Football League, as well as some of soccer's biggest clubs, including F.C. Barcelona, Paris Saint-Germain, Chelsea and Juventus. And with the FIFA World Cup 2018 in Russia just around the corner, don't be surprised when Nike-sponsored teams who make it to the tournament sell kits with NikeConnect in them. You can buy the NBA Connected jerseys online right now, while brick-and-mortar retailers will have them on October 12th. If you're in New York City, Chicago or Los Angeles, there's going to be the Nike By You Suite at select stores (Soho in NYC), where you'll be able to customize NBA jerseys using materials like satin and leather. Just don't expect to see LeBron James or Stephen Curry wearing one with NFC tags when they play, as the tech is designed to be only for fans of the sport, not the actual players. Maybe that'll change in the near future.